AFTER WEEKS of unstable equilibrium British politics has seen two breakthroughs. Theresa May, the prime minister, agreed to offer MPs a chance to vote to extend the Article 50 Brexit negotiations. This in effect takes a no-deal Brexit off the table for the time being. Meanwhile Jeremy Corbyn, the leader of the opposition, promised to support a second referendum on the final deal. This raises the possibility that a Brexit delay might eventually morph into a Brexit revote. The reason for these breakthroughs is that both leaders are losing control of their own parties. Mrs May’s Brexit strategy depended on confronting MPs with a choice between her deal and no deal. But early this week some 15 ministers, including three cabinet members, threatened that they would back a plan drawn up by Yvette Cooper, a Labour MP, to delay Brexit if Mrs May cannot get her deal through Parliament by a specified date. Following one of the most fraught cabinet meetings in years, Mrs May turned up to Parliament on February 26th to offer a succession of promises to appease the rebels: if her deal fails to pass by March 12th, she will ask MPs by the following day if they are willing to sanction a no-deal Brexit and then, assuming that the answer is no, the day after they will be able to instruct the government to go back to Brussels to seek an extension to the Article 50 Brexit deadline of March 29th. Mr Corbyn is a lifelong Eurosceptic who also recognises that a large minority of Labour voters backed Leave. But his leadership is in a battered state. Nine MPs recently quit, Tom Watson, the deputy leader, has formed a new moderate group within the party and a YouGov poll shows Labour trailing the Tories by 23% to 36%. This has enabled the party’s pro-Remain constituency to force him to promise a referendum in order to avoid further defections. What does all this add up to? Mrs May’s promise of a vote to delay Brexit was so explicit that she cannot go back on her word (though it is a measure of how little trust Mrs May has in Parliament that MPs agonised about whether they should bring their amendment forward as an insurance policy). But she nevertheless hedged her promise with Brexiteer-pleasing caveats such as that she wanted any delay to be “short” and “once only”. Her chosen new Brexit day is probably June 30th. A delay would do nothing in itself to tackle the great sticking point of the “backstop”, which seeks to prevent a hard border in Ireland by keeping the entire United Kingdom in a customs union with the EU. Geoffrey Cox, the attorney-general, and Stephen Barclay, the Brexit secretary, spent much of this week in Brussels trying to put into legal form EU undertakings that the backstop will be used only if necessary and that it is not intended to be permanent. Some hardline Brexiteers may yet decide to hold their nose and vote for Mrs May’s deal on March 12th, rather than risk the possibility of delaying or even reversing Brexit. Jacob Rees-Mogg, head of the European Research Group of Tory MPs, said this week that he would not insist on the backstop being dropped altogether. The Northern Irish Democratic Unionists, who voted against the deal last time, are sounding a little more emollient. Yet the prospect of putting back the deadline may have increased chance that soft Tories and Labour Leavers will vote against the deal, because it postpones the danger of crashing out with no arrangements in place. Then there is the question of how all this will go down in Brussels. An extension to the Article 50 talks would need the approval of all 27 governments. Emmanuel Macron has said that France would consider an extension “if it’s justified by new choices on the part of the British”. Spain’s prime minister, Pedro Sánchez, has made similar noises. Some Eurocrats suggest giving Britain up to a couple of years to rethink its approach and perhaps hold another referendum. But the majority support a short extension, not least because this would allow them to skirt the question of whether Britain should participate in this spring’s European Parliament elections. Mr Corbyn’s promise to support another referendum is more confusing. The Labour leader said that he would support a “confirmatory” referendum only in the event that Mrs May’s deal managed to pass through Parliament. It is not clear whether he might in future offer to support Mrs May’s deal in return for her putting it to the country, as some Labour MPs have suggested. And it is certainly not clear whether he will actually campaign for a second vote or simply go through the motions, as he did during the referendum campaign in 2016. Mr Corbyn’s willingness to campaign matters because, as things stand, it is unlikely that a Labour motion to support a second referendum would get through Parliament. Some 30 Labour MPs who represent Leave-voting constituencies would probably vote against such a motion but, so far, only a handful of Tories have come out in favour of a second referendum. Everything depends on what use Britain’s competing political factions make of a delay in the Brexit timetable. Mrs May’s strategy would be to chip away at her opponents by insisting that her deal, backstop and all, remains the only one available and by resurrecting the threat of a no-deal crash out, only in June rather than March. The Brexiteers would continue to push for a prize that they have been seeking for decades. The large group of moderate MPs would continue to resist the possibility of leaving without a deal on the grounds that it would do grave damage to the economy. (The government’s own analysis of the consequences of a no-deal Brexit, published this week, predicted lower growth, long delays at Dover and costly new customs procedures.) There is little reason to think it would be any easier to solve the problem of the backstop in the next three months than it was in the past three. 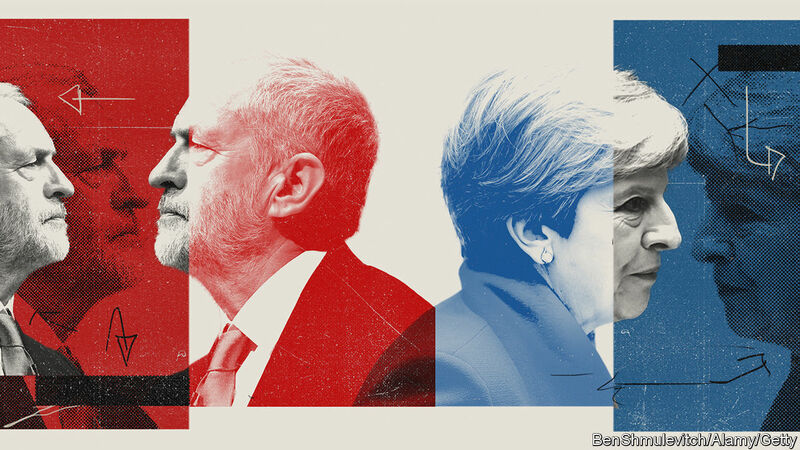 The only thing to emerge with any clarity from this week’s dramatic events is that Britain’s agonies are likely to go on for longer than originally billed. Those people who thought that March 29th might put an end to all the talk about Brexit are set to be sorely disappointed.